How can a YouTube channel have different names depending on where the name is shown? There's a Japanese channel I'm following, which is showing a different name depending on where the name is displayed. 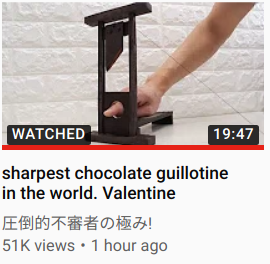 When their videos are shown in the subscription box, recommended videos, or next to a comment they made, a Japanese variant of the name is shown, "圧倒的不審者の極み!" However, when watching a video or looking at their channel page, an English version of the channel name is shown, "kiwami japan". The names are not equivalent when translated, so it's likely not an automatic translation. These two names have existed as long as I can remember following this channel, so it's not likely to be a matter of a name that was recently changed and not yet updated everywhere. Is this name duality just a glitch, or is it a feature offered by YouTube? What are the criteria for using this feature as a creator? Is it for example only available to creators in certain regions, or above a certain number of subscribers? Browse other questions tagged youtube username youtube-channel or ask your own question. How can I disable the advertisements shown before YouTube videos? How can I create a YouTube channel? How to change my YouTube channel name? How do you make a YouTube channel private and videos ONLY appear in channel? How to find YouTube Channel name for a Deleted video channel if you have a link to one of the video? How to cancel “Hide user from channel” on Youtube comment? Why YouTube shows two different names?